It makes perfect sense to treat both parts of the equestrian team for a truly holistic approach and most riders really benefit from some work on their back/neck/shoulders. 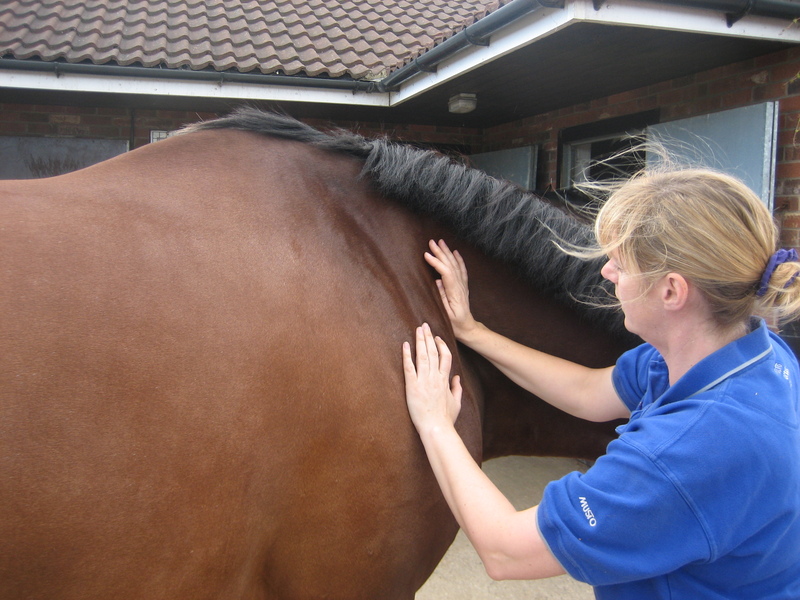 If you add a ‘chair massage’ to your horse’s therapy then the cost for this is just £15, making the total £65 for one horse and rider package. We know that the more assymetrical the rider is this affects the horse, who will attempt to compensate to achieve balance and may overwork certain muscles. Often riders show the same areas of tension as their horse and common areas are just below base of skull (poll on horse), around the shoulders and lower back and sacro-iliac area in particular. Another benefit is if the rider feels calm and less anxious, which usually occurs after massage, this positively affects the horse and vice versa. The energetic inter-connection between equine and rider means if they both feel well it enhances the relationship in all areas. 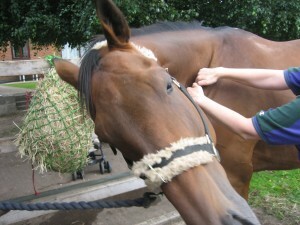 The rider massage takes approximately 30 minutes and the horse approximately an hour. Multiple horse & rider packages can be booked and a further discount may be applicable. We need to work somewhere dry and warm indoors for the rider massage as the British weather is rarely nice enough for outdoors work, though it makes a nice photograph! 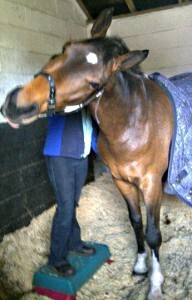 Plex loving his neck massage work in preparation for winning Petplan Equine National Advanced Medium Restricted Dressage April 2012 with an impressive 71.47%. (above) Lara receiving her regular therapy. Host a Chair Massage Clinic at your Yard for a minimum of 6 people and there may be incentives available for larger numbers of bookings. Chair Massage done through light clothing – no oil is used. Some people find the more upright position helpful if they have lower back issues. The Chair Massage is ideal for the usual rider / equine handler’s aches and pains as it covers the back/neck/shoulders and can incorporate arms and head too if necessary. Chair Massage is adapted to your needs and covers the back, shoulders and neck and may also include work on arms and scalp if needed in order to addresses all areas holding tension. Hayley employs many techniques including use of the forearm which ensurea comfortable, yet deep and effective soft tissue massage. Spreading the pressure over a larger area literally squashes the tension out of the muscles. Hayley also uses a variety of helpful massage tools too, eg. tennis ball and squash ball and gives clients self help tips on how to help tension day to day. Even ‘national treasure’ and one of the World’s Top Dressage Riders, Charlotte Dujardin OBE, has enjoyed a Chair Massage from Hayley to help with her neck tension and a headache. 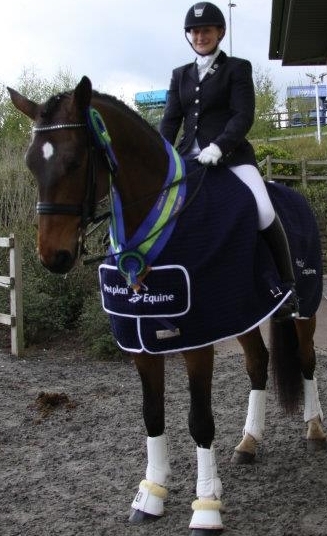 Charlotte and her partner Valegro currently hold the world record scores in all three grand prix dressage tests. They won two gold medals at London 2012, represented Britain at the 2014 World Equestrian Games (WEG) and claimed individual gold, setting a new WEG record, and team silver. In 2015 Charlotte and Valegro won the dressage World Cup Final in Las Vegas with a score of 94.169% and they were part of the British team at the 2015 European Dressage Championships in Aachen, which won team silver and Charlotte claimed gold in both the grand prix special and the freestyle.